The statue of John Candlish, situated in Mowbray Park, Sunderland. Location: Mowbray Park, Sunderland. Materials: Bronze and Pink Granite. Status: Listed Grade II. John Candlish (1816-1874) was born near Bellingham and moved to Sunderland when he was a young boy. Apprenticed to a draper at the age of 14, but became editor of the Sunderland Beacon at the age of 26. He then started a bottle-making business at Seaham and made his fortune supplying bottles to exporters of food to the colonies. 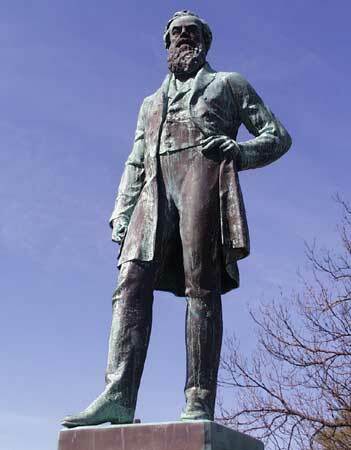 He was elected as Liberal councillor in 1848, Mayor in 1858 and Member of Parliament in 1866.